The ever-changing social media landscape can be an overwhelming realm to dive into. However, as search engines continue make changes to their algorithm to make search more social and personal, it is critical for hotels to not only have presence in these channels, but be active and engaging as well. This article explains the changes in search and why being a social hotel is more important than ever. The evolution of social media and how it is impacting search. Social media has greatly impacted the way brands and customers communicate with each other. What previously was a one-way communication with the brand throwing messages towards its target market, has now evolved into a two-way conversation with customers and leads. 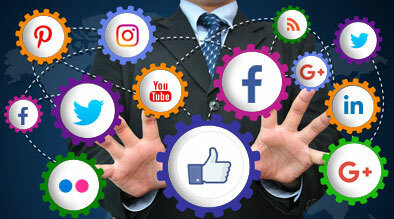 The importance of integrating social media into your hotel’s overall internet marketing mix can no longer be ignored as social networking is proven to be the most popular activity online, reaching 82 percent of the world’s online population and accounting for 1 of every 5 minutes spent online1. In October 2011, Facebook reached nearly 55% of the world’s global audience and accounts for three-fourths of the total time spent on social media sites1. Micro-blogging has also become a worldwide content-sharing phenomenon with sites such as Twitter, which reached 1 in 10 internet users worldwide and saw a growth rate of 59 percent in 2011. Furthermore, as search engines take notice of this online trend and realizing that more users turn to social networks for answers, they now work hard to incorporate social signals/activities into their ranking algorithm, making online search results more social and personalized in nature. 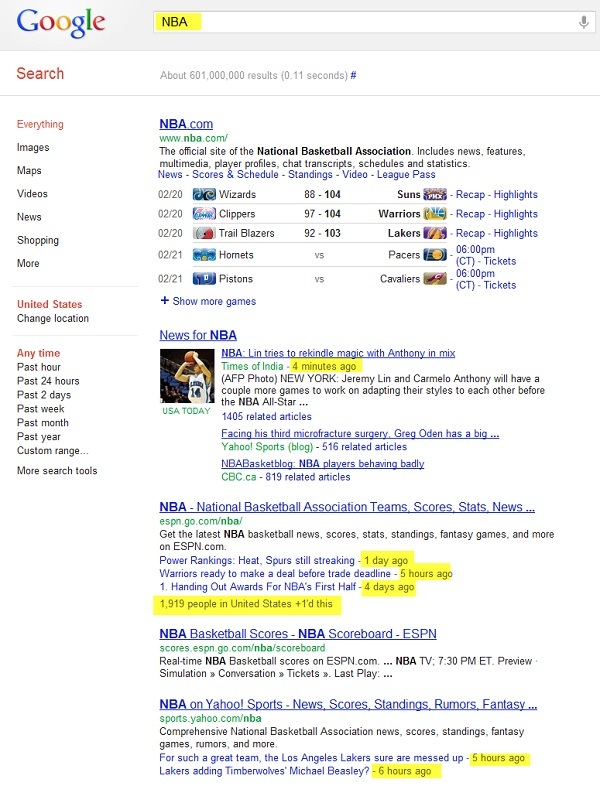 For example, Google’s recent release of Search, plus Your World allows users (while logged in to their Google accounts) to find the most relevant content on the web based on the user’s social activity, including their friends’ recommendations, posts, images, etc. alongside results from the web. The Changing Landscape of Hotel Search Engine Marketing is a great article that explains the changes in the way search engines provide content to consumers and how hotels can stay ahead of the competition. As any knowledgeable internet marketer would tell you, having a presence in social channels alone does not convert fans into bookings. Nor can it drive the best possible outcome for the hotel in terms of online traffic and revenue. Getting the best online results really lies in the hotel’s total web equity. 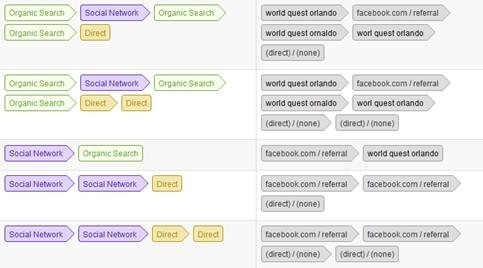 With the social media funnel in mind, hoteliers can identify factors that can drive a follower to the booking system and convert them into hotel guests. Furthermore, understanding the social media funnel can help hoteliers identify what part of their strategy is working or may be amiss. To explain further, if the hotel has a huge social media following yet do not see fan engagement (including like, share, retweet, etc. ), then the hotel’s content may not be engaging enough (Social – Familiarity and Sharing). If the hotel’s website is getting tons of traffic from its social media campaign, but most of these visitors drop out immediately, then it may be the site’s conversion factors that are amiss (Web/Mobile – Conversion Points). If click to booking engine is high, but actual booked revenue is low, then the problem could be with the hotel rates (Web/Mobile – Check Rates). 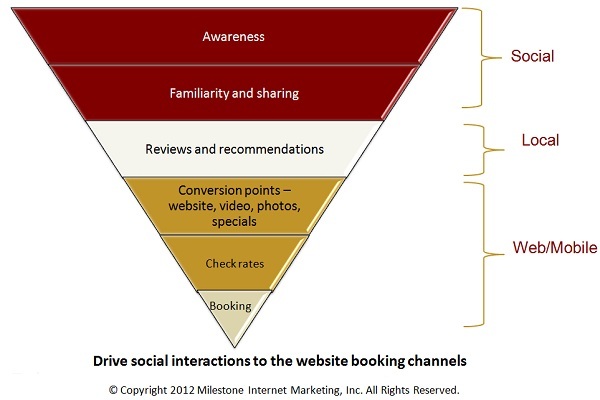 Understanding the levels within the social media funnel can help hoteliers fine-tune their internet marketing strategy. Audience engagement, fan mentions, etc. Many users today are going “SoLoMo” with their buying behavior. Today, 58% of mobile phone users have made purchases using their devices2. 42% of 18-34 year olds connect and socially share their purchases. In 2011, mobile search increased by 400% vs. 2010. 1 in 3 mobile searches today is local in nature. 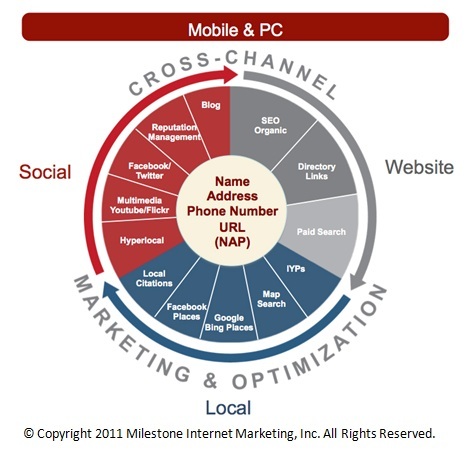 After looking up a local business, 61% of people will call and 54% will visit the location. These stats indicate social media, local, and mobile search all collide in today’s online world to provide an ultimate user experience3. SoLoMo is the combination of social media, local, and mobile strategies to drive awareness, traffic, and revenue for the hotel. Social helps with creating awareness and familiarity. Local helps narrow down results to a particular geo-targeted location. And mobile allows for instant purchase. The merging of all 3 strategies make up the “SoLoMo” evolution. As an example, a mobile phone user may search for places to stay in the city and find the hotel’s Google Local listing, checks the reviews, and decides to make a room reservation directly from his mobile phone. He then likes the hotel’s Facebook page and shares his recent booking on his own social media profile, all these directly from his smart-phone. Local placement is essential for any location based business – claim and enhance your hotel’s listing on Google, Bing, Yahoo, etc.